The Minnesota Vikings visit the Carolina Panthers in Week 14 of the 2017 NFL season. PFF previews the top player matchups of the game. 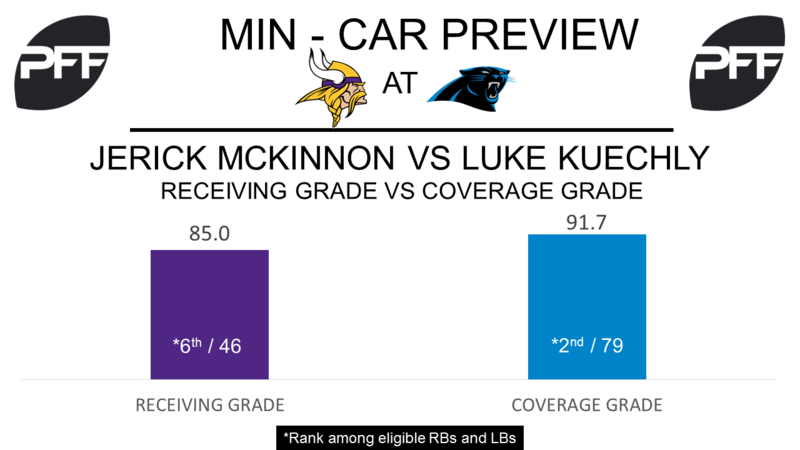 RB Jerick McKinnon vs. LB Luke Kuechly – One of the best receiving running backs will go one-on-one with one of the best coverage linebackers when the Vikings and Panthers face each other on Sunday. McKinnon has the sixth-highest receiving grade of any running back this season at 85.0, as he has forced nine missed tackles on his 41 receptions this season, which is the 10th-most this season. Kuechly ranks second with a coverage grade of 91.7 this season, as he has only allowed a passer rating of 69.2 when targeted, which is the third-best by a linebacker. G Joe Berger vs. DI Kawann Short – Berger could be in for a difficult task trying to block one of the best interior defenders in the league on Sunday, especially in the run game. Berger has the 22nd-best run-blocking grade of any guard this season at 75.4, whereas Short’s run-defense grade of 90.1 is the fifth-best among interior defenders. Short has 19 run stops this season, which is the 16th-most, and his run stop percentage of 11.1 is the seventh-best. WR Adam Thielen vs. CB Captain Munnerlyn – No receiver has a higher target percentage in the slot than Thielen this year at 25.7 percent. He has also been one of the most productive receivers in the slot position. Thielen ranks sixth in receptions (36) and receiving yards (465) in the slot. Expect to see him targeted a lot against the Panthers, as their primary slot defender Captain Munnerlyn has struggled there all season. Munnerlyn is allowing a passer rating of 107.6 when targeted in the slot, which is the 16th-highest mark by a slot defender in 2017, and his 7.9 coverage snaps per target is the eighth-highest. 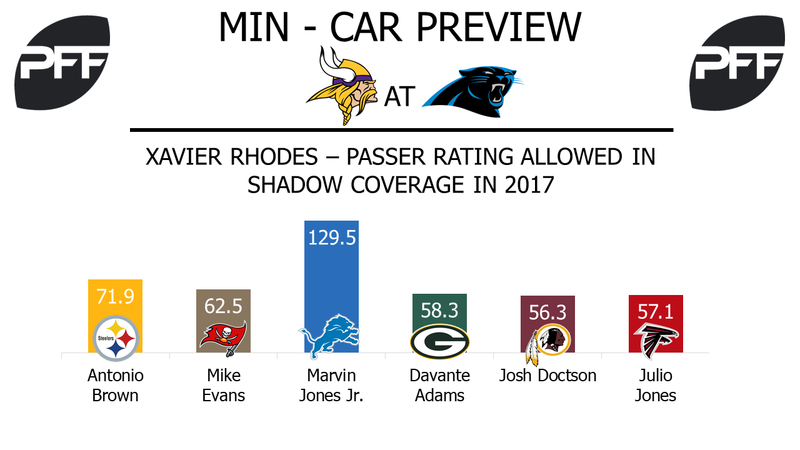 WR Devin Funchess vs. CB Xavier Rhodes – With four games remaining, Funchess has already set career highs in every receiving category this season, as he has taken over as Cam Newton’s top receiver. Funchess’ 94.0 passer rating when targeted is the highest among Panthers wide receivers, and Newton hasn’t thrown an interception when looking Funchess’ way since Week 6. At 6-foot-1, Rhodes is one of the taller cornerbacks in the league, but Funchess has done well against tall corners so far this season. He has a passer rating when targeted of 100.7 on 37 targets against cornerbacks 6-foot-1 or taller. Funchess has excelled on hitch routes this season, catching 11-of-14 targets for 120 yards, while Rhodes has allowed seven receptions on hitch routes, the most of any route this season. Rhodes will most likely shadow Funchess, as he has done to No. 1 wide receivers seven times this season. RB Christian McCaffrey vs. LB Eric Kendricks – McCaffrey has been electric in his rookie season for the Panthers, but he has had to fight for it, as 61.3 percent of his rushing yards have come after contact. But McCaffrey has only had 14.8 percent of his snaps come in the run game, the lowest percentage in the league among rookie running backs this season. But his receiving grade of 91.6 this season is third in the league among all pass-catchers. McCaffrey has had trouble on third and fourth downs this season, as his passer rating when targeted drops to 69.4 on those crucial downs. Kendricks has done well covering running backs this season, as the Vikings linebacker has yet to allow a touchdown to one on 29 targets. But he has missed 14 tackles this season, including eight in the passing game. T Matt Kalil vs. Edge Everson Griffen – Kalil has not had his best season in 2017, as he has allowed 35 total pressures, which is tied for the 10th-most among tackles in the league. But Panthers running backs have gained 5.12 yards per carry when rushing outside of the left tackle, the highest average along the offensive line. But he’ll be facing the fifth-highest graded pass rusher in the league in Griffen, who sports a pass-rush grade of 90.2. Griffen’s 11 sacks from the right side of the defense are tied for the most in the league among defenders.